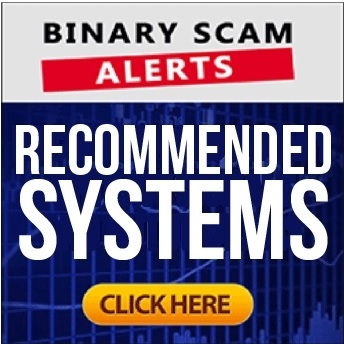 Binary Scam Alerts » Scam Reviews » Forex Maverick Review, SCAM Maverick App Exposed! 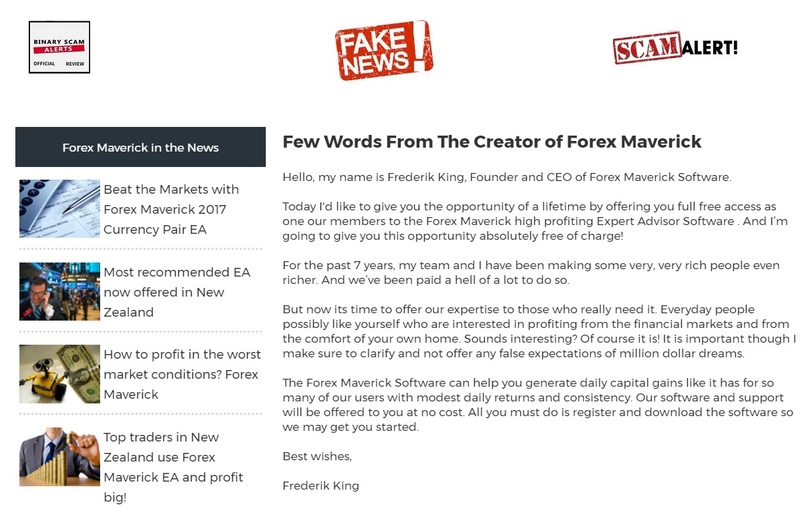 The Forex Maverick software and trading robot by Frederik King the fake founder and CEO is a bona fide and BLACKLISTED SCAM. In our detailed and impartial review and investigation, our staff of diligent researchers will provide all the proof and evidence required in order to validate this fact. But first, a word of caution. It has been bought to our attention that there is a rogue group of unethical affiliate marketers peddling this filthy fake signals tool. This is extremely disturbing, so please refrain from clicking on any links you received from these spammers and unsubscribe immediately. Additionally, one of our trusted contacts in the online trading industry has alerted us that the crooks pulling the strings behind this scam are professional spammers and con artists. They know how to infiltrate your inbox and get their malicious messages across very effectively. We know that at first glance Forex Maverick may seem to be a legit or genuine app, however this could not be further from the truth. These online promoters are masters of deception and understand how to mislead, bait, and victimize unsuspecting opportunity seekers like you who simply wish to make some passive income trading binary options online. Keep reading to see how we exposed these cheaters and what we believe this fake Forex app is a confirmed financial scam. Official Website, Login Page, and Members Area: http://www.forexmaverick.co/lp2.php? Below you will see an image of Frederik King and Mari his new Beta Tester. Needless to say this whole gig is staged and King is a paid actor who is performing at the behest of the producers of this vile scheme. Moving along, below we see the registration date for the domain listed as purchased on February 2017. This is a new domain and in complete contradiction to their phony claims that the system has been making money for a long time. The final nail in the coffin is the fake news section. A simple Google search will reveal that King and Forex Maverick were never in the news and in fact this is a marketing gimmick designed to trap and trick you into thinking the software is legit. He was supposedly one of the “elite financial traders” of his time, until one day he decided to leave his job and pursue his dream. So he set up his own private trading firm and that is when Forex Maverick was created, and trading secretly for some of the world’s most famous celebrities and multi-millionaires. Today only Frederick is offering 50 free trial offers for new members, but you have to be an action taker otherwise this once in a lifetime opportunity will pass and you would have missed your chance to become a millionaire. King claims he rejects society’s norms and allows his members to live the lifestyle most people can only dream of. The sales video doesn’t waste any time and gets right to the point. We have a staged acting scenario where King is guiding a new member of his Forex Maverick team named Mari. He asks her a bit about her experience in trading and what her expectations are, and then they both proceed to register and fund a trading account. After they come back from lunch we see that Mari whose “a little nervous and excited” is in the money already and has made easy profits on auto-pilot. The product is marketed as “an easy to use Forex strategy software that actually does work”, but after checking the accuracy levels of this app and seeing the actual results we know it is a losing software. King claims that by clicking your mouse 4-5 times a day you could make thousands of dollars and live the easy life without any form of financial stress or worries. The charade continues as Charles Newman, starts spewing lies about how this software has transformed his life. This is followed by Thomas Carson, Michelle Lewis, and Albert Hernes who claims he makes anywhere between “$40,00 to $50,000” thanks to this software. Dream on! It’s going to cost you at least $250 to join this sleazy program, and that is just to start out. If you were baited into re-investing then you stand to lose much more. This money will be charged to your credit card by rogue offshore and unlicensed brokers. In reality King is a paid actor and so is Mari and the rest of the beta testers. What we are witnessing here is the usual forms of hyped up and exaggerated claims of easy money, inflated bank accounts, fake testimonials, and just outright lies and fabrications. The narrative is not only recycled and boring, it’s also full of holes and inconsistencies which is the worst part of it. The hot scams to watch out for are TAI Robotic and Quantum Code by Michael Crawford. If you are not quite sure about which system is right for you then you are not alone. We are constantly asked which alternatives we recommend. So regardless if it is a manual signals solution or fully automated trading robot you are searching for we have it all in our recommended section. Feel free to check it out. The Forex Maverick trading robot and automated software by Frederik King is a scam, and we blacklisted it since there is no disputing this fact. The proof and evidence our staff produced is conclusive and based on pure facts only. If for some reason you were led to believe the Forex Maverick app is legit or genuine, then you had best get ready to have your money stolen and wallet fleeced by unethical brokers operating out of shady and unregulated jurisdictions. If you have deposited then DO NOT reinvest, and never agree to sign any document or accept a free perk or incentive like a bonus. These “gifts” are used by brokers as a tool to get you to continue trading instead of cashing out. In light of all the damning evidence we produced, we are again forced to BLACKLIST Forex Maverick, add it to our SCAM bucket, and advise our members to seek more reputable alternatives. We have also noticed some Scam CFD brokers aligning themselves with this new scheme. Legit brokers are licensed and regulated by CySEC, FCA, ASIC, for example. If you are not sure about choosing the right broker simply message us by leaving a comment below. As always, we invite you to join our Facebook page and Subscribe to our YouTube Channel.